Home Business Analytics Creating a flawless winning strategy in a Casino (BlackJack) using Data Science? Can we create a flawless winning strategy in a Casino using Data Science? Of course not! Otherwise, all the data scientists out there would be sitting on piles of cash and the casinos would shut us out! But, in this article we will learn how to evaluate if a game in Casino is biased or fair. We will understand the biases working in a casino and create strategies to become profitable. We will also learn how can we control the probability of going bankrupt in Casinos. To make the article interactive, I have added few puzzles in the end to use these strategies. If you can crack them there is no strategy that can make you hedge against loosing in a Casino. How many times have you gambled in a Casino till now? How many times have you lost all your money in a Casino? If your answer for second question is more than half of question one, then you fall in same basket as most of the players going to a Casino (and you make them profitable!). Now here’s an interesting fact, for most of the games you play at a Casino, you will win the amount in line with your odds of winning. For example: If the probability of winning in a roulette table is 1/37, you will get 37X of the amount you had bet. Hence, the expected losses of a trade in Casino is almost equal to zero. Why do our chances of gaining 100% or more are less than 50% but our chances of losing 100% is a lot more than 50%. Let’s start with my recent visit to a Casino. Last week, I went to Atlantic City – the casino hub of US east coast. BlackJack has always been my favorite game because of a lot of misconceptions. For the starters, let me take you through how BlackJack is played. Every card has a value. 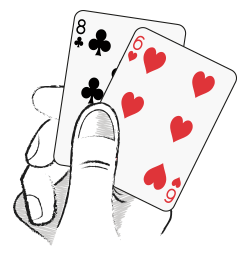 Ace card is counted as 1 or 11 points, numbered cards (2 to 9) are counted at face value. 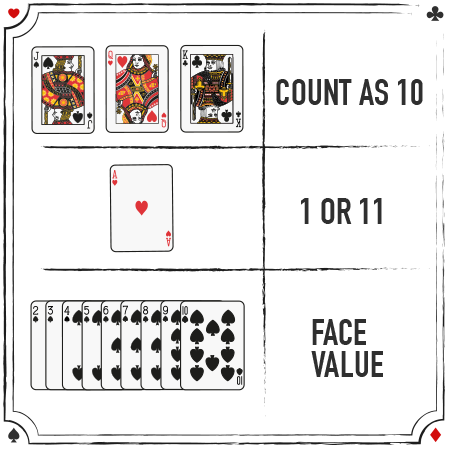 10 numbered card and face cards are counted as 10 points. The value of a hand is the sum of the point values of the individual cards. Except, a “blackjack” is the highest hand, consisting of an ace and any 10-point card, and it outranks all other 21-point hands. If the sum exceeds 21, it is called a “burst” and whoever has a burst looses right away. After the players have played their bet, the dealer will give two cards to the each player and keeps one card for himself. The dealer will ask the players for any further bet, and a player can choose to double the bet based on his 2 cards and dealer’s 1 card. Then the dealer will ask the player if he/she needs more cards. Player tries to maximize his score without being burst. After the final bet, the dealer will open more card for him/her. Dealer will keep opening his/her cards, until the value reaches 17 (Dealer might have to open another card if he/she has an Ace card counted as 11, and total sum as 17 – this is called soft 17). Finally we count players points and dealers points. Higher point wins. There are a few more complicated concepts like insurance and split, which is beyond the scope of this article. So, we will keep things simple. I always thought that given the dealer has a constraint of opening cards till he/she reaches 17/18, they cannot stop taking more cards. Hence, a player has better odds of winning than the dealer as he/she has no such constraints. I was excited about all the winning I was about to get!! As soon as I entered the Casino, I separated $X in my purse as “Casino money”, Got my cash converted into chips, and with in the next hour, I was bankrupt. I was not done yet – In hopes of recovering the money I lost, I donated another $2X in two rounds and I was finally convinced that the game was not as simple as I thought and I needed to pull out my data science hat to win it. Understanding of basic probability will be a plus. I will try not to talk a lot in that language. So if you are scared of probabilities you are fine. If you know R, you will be able to run the simulations on your own. No knowledge of R is required to understand the output. What is the probability of a dealer going burst given I know which is the first card of the dealer? What is the best strategy for a player if he/she knows his/her first 2 cards and dealer’s 1 face-up card? What is the probability of winning given I know a player’s final score and dealer’s single face-up card? What is the probability of winning BlackJack at this point when the cards are yet to be dealt? Is it more than 50% as I thought, or was I terribly wrong? Why do we lose / become bankrupt most of the time when we gamble in a Casino? When does this betting strategy work and when does it backfire? Using such a strategy, can we change the expected value of losses / gain compared to random betting (or single value betting)? Can we win against Casinos? Did I uncover the secret of winning a million dollars in a Casino? I can certainly use that when I go to Casino the next time. Is it better to play BlackJack or simply win on a flip of coin/play roulette if the only objective is to win money? Here is a situation, you see that dealer has a “4” open and following are your cards. Your total score is “14”. What would you do? By now, you will know that your cards are really poor but do you take another card and expose yourself to the risk of getting burst OR you will take the chance to stay and let the dealer get burst. A lot of people will recommend you to stay till dealer’s cards are as bad as yours – let us check out through simulations. Let us try to calculate the probability of the dealer getting burst. I will first define a few basic functions on R and then simulate dealer’s hand. ### This is where I simulate the game 10,000 games of blackjack for the dealer. ###There are 6 possible outcomes for the dealers - getting a hard 17, 18,19, 20, 21 or getting burst. 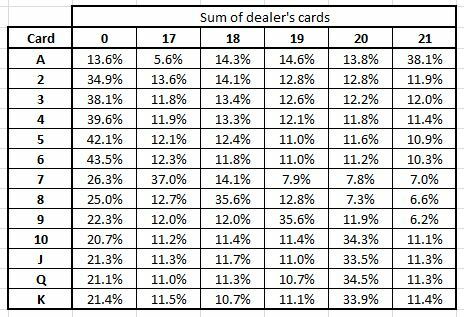 Here is the probability distribution given for the first card of the dealer. The probability of the dealer getting burst is 39.6%, which will be player’s probability of winning. This means you will loose 60% of times – Is that a good strategy? We can’t answer that question until unless I know what is the probability of winning if I take one more card and either increase or burst my score. Insight 1 – Probability of the dealer getting burst given his/her first card (say is 4) can be found from the table above (39.6% in this case). Now we need to bring in player’s cards as well and find what is the probability of winning if the player has a “14” in hand. With this additional information, we can make refinement to the probability of winning given our 2 cards and dealers 1 card. ###Define the set for player's first 2+ sure card sum. It can be between 12-21. If the sum was less than 12, player will continuously take more cards till he is in this range. ###Player does not Draws a card! The reason the row 21 has a lot of 100% is that with just 2 cards, 21 is a black jack. And if the dealer does not have the same, the Player is definite to win. The probability of winning for the player sum 12-16 should ideally be equal to the probability of dealer going burst. As this is the only way Player is going to win if he/she chooses to stay. Dealer will have to open a new card if it has a sum between 12-16. This is actually the case which validates that our two simulations are consistent. To decide whether it is worth opening another card, calls into question what will be the probability to win if player decides to take another card. Insight 2 – If your sum is more than 17 and dealer gets a card 2-6, odds of winning is in your favor. This is even without including Ties. ###In this simulation the only change from simulation 2 is that, player will pick one additional card. To make this analysis simple, let’s say favorable probability is Chances to Win + 50% chances to Tie. Favorable probability table if you choose to draw a card is as follows. So what did you learn from here. Is it beneficial to draw a card at 8 + 6 or stay? Clearly you are better off drawing a new card, which was so counter intuitive. Here is the difference of %Favorable events for each of the combination that can help you design a strategy. Cells highlighted in green are where you need to pick a new card. Cells highlighted in pink are all stays. Cells not highlighted are where player can make a random choice, difference in probabilities is indifferent. Insight 2 – Follow the below grid to take a decision whether to stay(0’s) or “hit me” (1’s). SHOCKER!!! Our win rate is far lower than the loss rate of the game. It would have been much better if we just tossed a coin. The biggest difference is that the dealer wins if both the player and the dealer gets burst. If you remove that single condition, here are the win/loss rate. As you can see, both dealer and player burst in about 8% of the games. By just changing this small thing, Casino’s make sure that we loose much more frequently than the house do. Insight 3 – Even with the best strategy, a player wins 41% times as against dealer who wins 49% times. The difference is driven by the tie breaker when both player and dealer goes burst. This is consistent with our burst table, which shows that probability of the dealer getting burst is 28.4%. Hence, both the player and the dealer getting burst will be 28.4% * 28.4% ~ 8%. 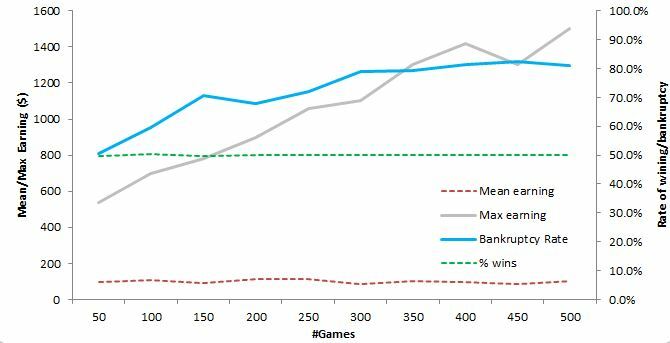 Now we know what is the right gaming strategy, however, even the best gaming strategy can lead you to about 41% wins and 9% ties, leaving you to a big proportion of losses. Is there a betting strategy that can come to rescue us from this puzzle? The probability of winning in blackjack is known now. To find the best betting strategy, let’s simplify the problem. We know that the strategy that works in a coin toss event will also work in black jack. However, coin toss event is significantly less computationally intensive. ### Min_bet is the minimum bet in this game; last victory is 1 if you won the last game. Did any of the above 4 metrics shock you? What got me to thinking was that even though the average value of anyone leaving the casino is same as what one starts with, the percentage times someone becomes bankrupt is much higher than 50%. Also, if you increase the number of games, the percentage times someone becomes bankrupt increases. Why is that? The reason is that we have a lower bound at $0 which is bankruptcy, but we don’t have an upper bound. On your lucky days, you can win as much as you can possibly win, and Casino will never stop you saying that Casino is now bankrupt. So in this biased game between you and Casino, for a non-rigged game, both you and Casino has the expected value of no gain no loss. But you have a lower bound and Casino has no lower bound. Simply put, let’s assume that you start with $100. If you win you can reach as high as $1000 or even $10k. But the expected value of your final amount is still $100 as the game was even. So, to pull the expected value down, a high number of people like you have to become bankrupt. Let us validate this theory through a simuation using the previously defined functions. In Mathematical style – Hence Proved! Clearly the bankruptcy rate and maximum earning seem correlation. What it means is that the more games you play, your probability of becoming bankrupt and becoming a millionaire both increases simultaneously. So, if it is not your super duper lucky day, you will end up loosing everything. Imagine 10 people P1, P2, P3, P4 ….P10. P10 is most lucky, P9 is second in line….P1 is the most unlucky. If all of them start with $100, the first one becoming bankrupt will be P1, and his $100 is divided among the other 9. Next in line of bankruptcy is P2 and so on. So, you might think P3 is on his lucky day, but if he/she plays enough number of games after P4 is gone, he is now fueling the earning of P2 and P1. In no time, P1 and P2 would rob P3. Obviously P2 is next and finally P1 will leave the casino with $1000 in his/her pocket. Casino is just a medium to redistribute wealth if the games are fair and not rigged, which we have already concluded is not the case. If all P1-P10 are playing black jack, I won’t be surprised if all of them loose bankrupt as dealer has higher odds of winning a game. 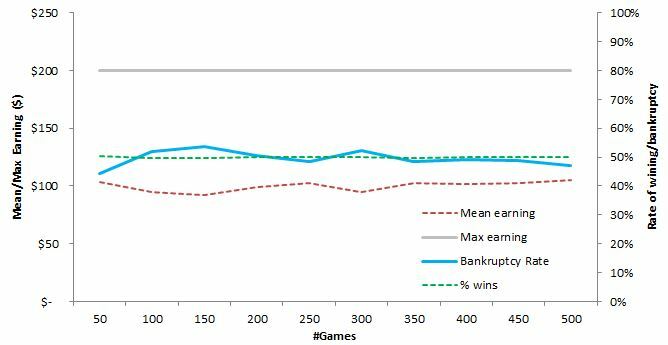 Insight 4 – The more games you play, the chances of your bankruptcy and maximum amount you can win, both increases for a fair game (which itself is a myth). Is there a way to control for this bankruptcy in a non-bias game? Fortunately YES! What if we make the game fair. The lowest you can reach is a loss of $100. Let us now fix the highest profit you reach is also $100, and then you stop no matter what. Let’s try to simulate this. BINGO! % times reaching $0 is 50% and other 50% reach $200. Now this looks fair! Let us run the same simulation we ran with the earlier strategy. Again mathematician style – Hence Proved! The Bankruptcy rate clearly fluctuates around 50%. You can decrease it even further if you cap your earning at a lower % than 100%. But sadly, no one can cap their winning when they are in Casino. And not stopping at 100% makes them more likely to become bankrupt later. Insight 5 – The only way to win in a Casino is to decide the limit of winning. On your lucky day, you will actually win that limit. If you do otherwise, you will be bankrupt even in your most lucky day. Here are a few exercise you can try solving and reply back in the comment section. Exercise 1 (Level : Low) – If you set your higher limit of earning as 50% instead of 100%, at what % will your bankruptcy rate reach a stagnation? a. If the expected value of winning changes? b. Does probability of winning changes at the end of a series of game? You can give the results as a function of number of games/minimum bet/total initial money in your pocket. c. Is this strategy any better than our constant value strategy (without any upper bound)? Talk about bankruptcy rate, expect value at the end of series, probability to win more games, highest earning potential. d. Does the strategy makes sense if you play a high number of matches or low number of matches for say – Minimum bet of $1 and Total initial money in pocket $100. High number of matches can be as high as 500, low number of matches can be as low as 10. Exercise 3 (Level – Medium) – For the Martingale strategy, does it make sense to put a cap on earning at 100% to decrease the chances of bankruptcy? Is this strategy any better than our constant value strategy (with 100% upper bound with constant betting)? Talk about bankruptcy rate, expect value at the end of series, probability to win more games, highest earning potential. Casinos are the best place to apply concepts of mathematics and the worst place to test these concepts. As most of the games are rigged, you will only have fair chances to win while playing against other players, in games like Poker. If there was one thing you want to take away from this article before entering a Casino, that will be always fix the upper bound to %earning. You might think that this is against your winning streak, however, this is the only way to play a level game with Casino. I hope you enjoyed reading this articl. 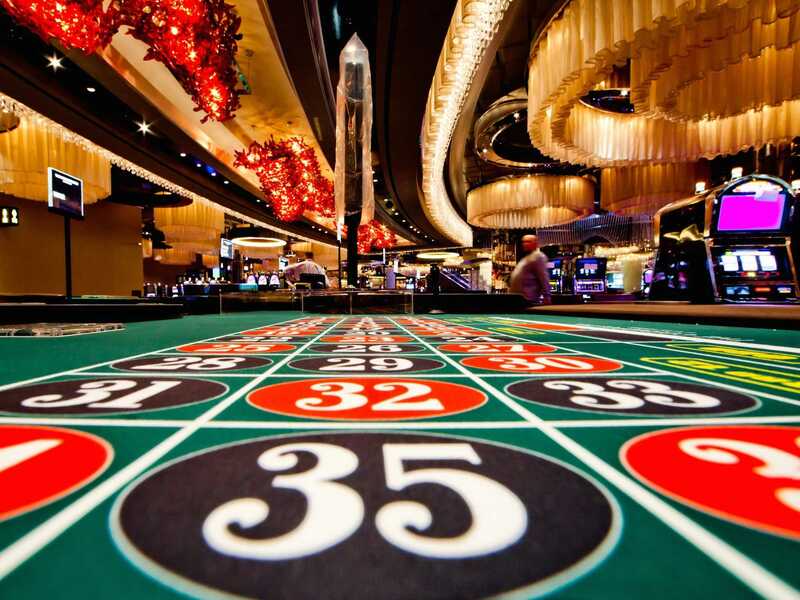 If you use these strategies next time you visit a Casino I bet you will find them extremely helpful. If you have any doubts feel free to post them below. Now, I am sure you are excited enough to solve the three examples referred in this article. Make sure you share your answers with us in the comment section. Uumm. The odds in a casino are not in line with the odds of winning.. Your number will come 1/37, however you will be paid 1 to 35 = 36 when it comes in. So you lose 1 bet even when you win, and that is the casino’s edge. Correctly pointed out. Or we could just go random as well in the game and yet come out even every time. Very helpful & well written artical. I enjoyed It. Thank you. Interesting information! It’s unfortunate that the theory can’t be practically applied in all cases, but having this knowledge definitely should reap some reward on the casino floor. Thanks for sharing!